Details on the programs may be found at their web site www.seacadets.org. 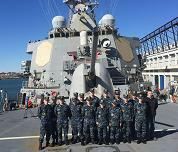 The Massachusetts Bay Council provides support, recognition and awards to the following units in Eastern Massachusetts, including some financial aid, awards for the annual NSCC Region Swim Meet and Youth Medals to outstanding Cadets. Those units with asterisks* are sponsored or co-sponsored by the council. 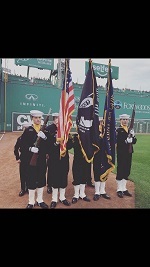 Constitution Division, NSCC, sponsored by Massachusetts Bay Council, provided the Color Guard for the Boston Red Sox at Fenway Park on May 26th. In the photo are T. Martinuk, D. McAuliffe and M. McAuliffe (twins), J. Shields, C. Mathieson, J. Young, and J. Jarosiewicz. Commanding Officer is LCDR Alfred McMullen, NSCC.